I love using lists. It’s like all our favorite people in ONE place. The crème de la crème of your social network. When you start following tons of people, chances are, your stream just keeps flooding with all kinds of tweets. It becomes difficult to read all the important and helpful tweets in between the “noise.” The solution for this is to make a list. Currently you are allowed to create up to 20 lists, and each list can include up to 500 users. So, theoretically, there is room to include as many as 10,000 people on your lists. They allow you to easily categorize the people and accounts you’re following on Twitter. You decide what the theme of each List is or if there’s even a theme at all. 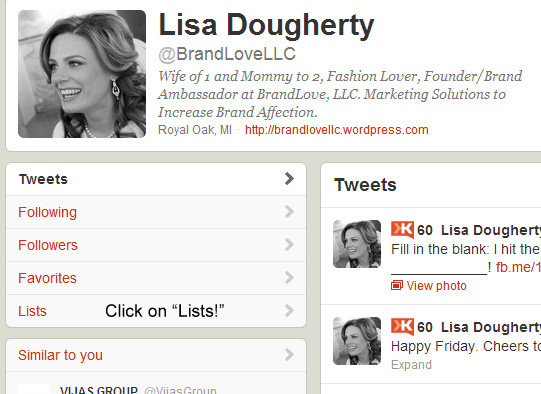 Lists are a great way to split who you follow along the lines of work and play, by topic, or by relation to you. Remember: the quality of the lists you’re on is more important than the number of lists you’re included on. Being on a respected person’s “Best Web Designers I Know” list can be of more value than being on 10 “Nice People” lists from random strangers. Twitter Lists reduce the clutter and make Twitter itself easier to use because you no longer need to read everyone’s tweets in one stream of information. Instead, you can divide that stream into separate streams that are easier to follow and more focused on topics that you create. Also, keep your Lists small, so their easier to read and it doesn’t defeat the purpose of creating a List. For best usage, aim for medium-sized lists (between 20 and 200 names). If you just have 2 people on a list, you might as well just visit those people’s Twitter profile pages to view their tweets. And if you include 400 users, it is unlikely that you’ll be able to keep up with all of their tweets. 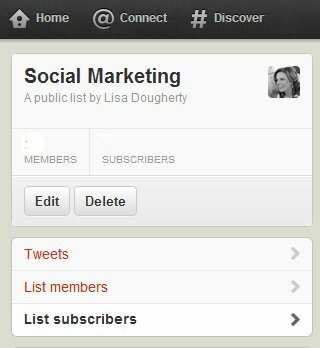 By making your Twitter Lists public, you’re sharing them with everyone else. If you create Lists that are valuable to other people, they will follow your Lists instead of taking the time to create their own. Also, by filtering tweets, you have a content provider providing a constant stream of retweetable material. When you list someone, it shows that you value their tweets and read their content. It’s a form of appreciation on Twitter, a gesture of gratitude. You might get listed back too. Do not feel compelled to reciprocate being put on a list, but feel free to thank the person if being included is a compliment to your relationship or competence in your field. Keep your list private until you want your list to be public and you’ve notified the people you’ve added to your list. Now that you’ve created your first List, a link to that List should appear in the Lists area in the sidebar of your Twitter profile. 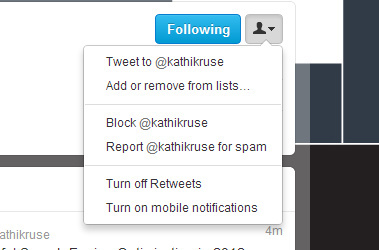 When you click that link to visit one of your Lists, there will be links to edit or delete the List (shown below). Click “Edit” to add or remove people or click “Delete” to remove the list. Click the person icon drop-down menu on a user’s profile. A pop-up will appear displaying your created lists. Check the lists you would like to add the user to, or uncheck the lists you’d like to remove the user from. To check to see if the user you wanted to add was successfully included in that list, navigate to the Lists tab on your profile page. Click the desired list, then click Members. The person will appear in the list of members. Congrats, you’re done! Play around with lists and think of them as works in progress instead of tablets written in stone. Create them, add people, take people off, delete a list, and create new ones. They are tools to be used, not measures of yours or other people’s worth. Use your expertise and knowledge of your field to craft a high quality list and then submit it to Listorious and other Twitter List directories so that others can benefit from your work and talent. 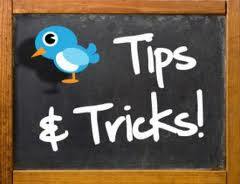 Be sure to choose appropriate tags and write a list description that best captures its content. If you found this article helpful, be sure to follow me on Twitter, “Like” me on Facebook and follow BrandLove, LLC on LinkedIn. I post many more tips and tricks on my other social channels. Thanks for reading my post and I appreciate your support!